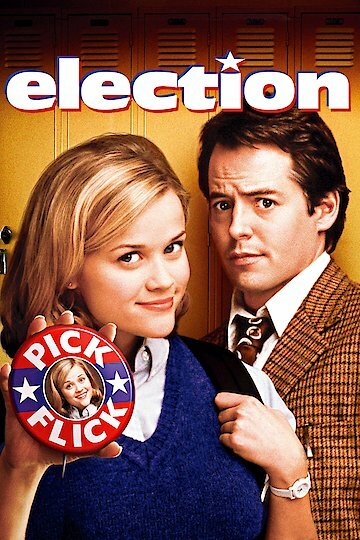 Election is a pitch-black comedy directed by Alexander Payne. It stars Matthew Broderick, Reese Witherspoon, Chris Klein and newcomer Jessica Campbell. The movie is a satire on politics and the lives of suburban high schoolers. Each of the four main characters narrates part of the film. It starts with Jim McAllister (Broderick), a civics teacher who absolutely loves his job. He is also the staff member in charge of the student elections. Tracy Flick (Witherspoon) is a high school senior who is running unopposed in the latest election, much to his chagrin. A former colleague, and close friend of his, was fired due to having an affair with the student. Not only does he hold this against her, but he also cannot stand Tracy’s overachieving personality. He convinces a popular football player, Paul Metzler (Klein), to run as well. Paul’s younger sister, Tammy, also becomes involved in the race. She is dumped by her girlfriend who promptly moves on to seducing and dating Paul. In retaliation, Tammy runs a campaign based on the fact that school politics are completely ridiculous and meaningless. What follows is a battle of wits between teacher and student, brother and sister. Each has their own reasons for the actions they take. Tracy wants to win the presidency so it looks good on her application. Tammy falsely confesses to defacing campaign posters so she can be sent to an all girls school. Mr. McAllister fixes the election due partly to his personal distaste for Tracy and partly for his desire to have a humble winner. Only Paul, who wants to win the election to please Mr. McAllister, seems to have pure intentions. Election was produced by MTV films. With sharp dialogue and intelligent performances, it went on to be a critically acclaimed film with 21 awards. Although performing poor at the box office, it has become a cult hit on home video and DVD. Election is currently available to watch free on Pluto TV and stream, download, buy on demand at Amazon, Vudu, Google Play, FandangoNow, iTunes, YouTube VOD online.